We woke up this morning to Bella not feeling well. 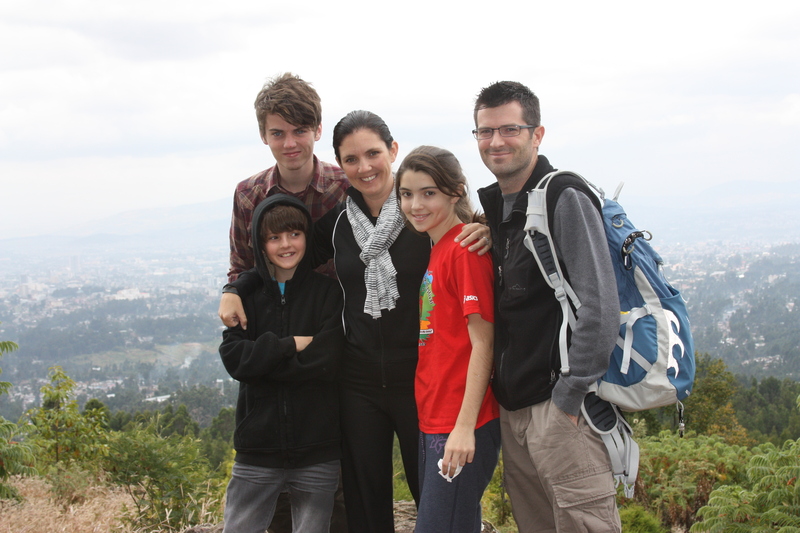 She stayed in bed through breakfast, but when Solomon got here she rallied to ride up the mountain. Probably not such a good idea, steep and winding, not to mention we are already at a higher altitude than Colorado. We stopped to take pictures and she got sick 😦 She felt a little better so we continued our journey up the mountain. 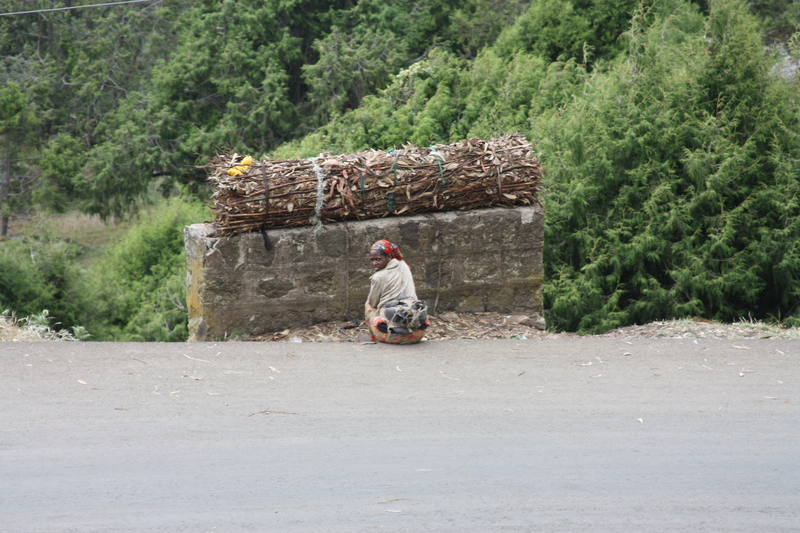 When you are in Addis you think the poverty is more than you could imagine seeing, then you have your driver tell you the poor people live up the mountain and it kind of rocks you. After our journey, I took Bella back to the guest house to rest and the boys went out exploring with Solomon. You can tell the boys were exploring with their Dad….Wells came home with a goat hide bean bag chair. He told me he liked shopping with the guys way better, because apparently men never think A. how will we fit that in our luggage and B. what in the world will we tell customs. We rescheduled our visit to Korah to tomorrow after our court date, Solomon didn’t want any of us to miss it. After sleeping all day Bella was feeling well enough to go to Kechene. Kechene is the government run orphanage in Ethiopia for older girls. A group from Washington was providing the girls with a pizza party. They also brought little goody bags. These girls were so excited! The bags held travel size toothpaste, a lotion, soap or body wash, chapstick, hair band, 2 pieces of candy, and a toothbrush.The joy of a gift was so apparent, even when they didn’t know what some of the items are used for. We had fun using gestures to explain how to use the products. Their excitement was humbling. It was like Christmas. The girls then formed a large circle and started clapping and singing. They would take turns dancing in the middle. Then they started a game where they would point to a person and they had to dance inside the circle. They had already been going crazy over Wells and his hair, calling him “Justin Beiber” and basically petting his head. So, imagine the chaos when they pointed to him and he started doing the worm in the center. He was kind of a rock star. I met a special girl there. She is 13 and just beautiful. Her english was broken, but we could communicate. She has a shy, sweet smile….and when I asked what she likes to do she said she loves basketball!!!! I asked if she played there and she said no, she didn’t have a ball. It is so hard for me to wrap my head around this. At the end of the night she asked me if I was the kids mother and I said yes. She smiled and nodded, then got teary and told me that her mother and brother died, and she didn’t know where her father was. I don’t even know what to say. I sat and held this teen-age girl and my heartaches to bring her home. She asked for my email and if I would please come back. I am praying for a way to invest into her life. The kids were pretty tired after the orphanage visit. We sat and tried to process what we had seen…but, not sure that is possible. All of our hearts ache for these kids. Not that they would have material things, but that they would be warm and their bellies full…and more importantly feel loved. Tomorrow is court. We go to bed filled with hope and excitement. That we might be able to shout to the world we belong to Corrie Melawit!